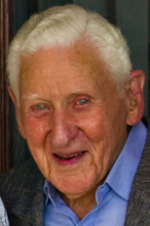 It is with a heavy heart that we announce the passing of Paul Marcus at 103 years old. Paul Marcus was a founding member of PSA Security Network and considered to be one of the founding fathers in the physical security system integration industry as a whole. He served as a powerful guiding light to PSA Security Network during the beginning years of the company. His dedication to PSA and the security industry was exemplified by his service as the Chairman of the Board for PSA Security Network for many years and his ongoing commitment to moving the industry forward. His legacy has been carried forth by his children, Jeff Marcus and Neal Marcus, who have served on many security industry committees, including Jeff following his father’s path as Chairman of the Board for PSA. His son, Jeff Marcus, offers the following memorial message. Paul Marcus had a long and varied business career. From age 18, he worked in, or owned, a variety of businesses, starting with his father’s clothes manufacturing/distribution business, then to department store management, then to owing three of his own retail clothing stores, and on to managing the mountain region of a record (music) distribution business. In 1969, at the age of 56, a friend told him about a franchise opportunity called Photo-Scan, which was in the closed-circuit television business. It is important to remember that this was 1969, when few people had ever heard of CCTV, much less knew what it could be used for. But since Paul was willing to try pretty much anything, he decided to give this a try, and started Photo-Scan of Colorado. While Paul could sell practically anything, he was what you would call somewhat technically challenged. After completing his training in California, he came back to Denver and started making sales calls. On one of his first calls he took out his demonstration camera and monitor. He hooked them together and prepared to demonstrate them to his potential client. Only trouble was, there was no picture. He tried several things including using a screwdriver to try and make adjustments inside the camera, as if he actually knew what any of these adjustments did. Finally, the customer looked at the camera and asked him: “Do you think it might work better if you took the cover off of the camera lens?” Despite these “technical challenges,” the business grew. Early on, Paul learned that the franchisor was very good at selling franchises but did not provide any additional help. So, after a year or two in the business he got on the phone and began calling some of the other franchise holders to see if he could learn from them. At one point, he suggested that they all get together and share ideas and information. They all met in Chicago, and at that meeting Paul suggested that they each put in a $100 and form an association to share information. They named it Photo-Scan Associates. Since Paul had made the suggestion for the organization in the first place and got it going, they voted him the group’s first president. Eventually, Photo-Scan Associates shortened its name to PSA. Later, the moniker was changed to PSA Security Network, as it started including many members who had no association with Photo-Scan. Paul served as president and on the Board of Directors for several years before turning the mantle over to his son Jeff, who had joined his company a few years earlier. Jeff served on the PSA Technical Committee for several years, before becoming a regional director, Vice Chairman of the Board and eventually Chairman of the Board for nine years. His other son, Neal, joined the company a few years later served on several PSA committees. In 1977, PSA was converted to a buying co-op, which pooled the combined purchasing power of the independent owners to negotiate better pricing and terms with the manufacturers. Today, PSA has grown into the world’s largest electronic security systems cooperative with the combined membership sales of several billion dollars annually. Each year, PSA presents an award to one member who has not only purchased often through PSA, but who has made significant contributions to the success of PSA and PSA’s many educational and industry programs. Several years ago, PSA changed the name of this award to the Paul Marcus Award in appreciation of the venerable institution that he created. Paul continued to work in the family business, and even after turning the management over to Jeff in 1981 he continued to work in the business for 27 more years. In the mid 1980’s the family changed the Photo-Scan of Colorado company name to Securus, after adding access control to the company’s product mix. In 2005, the family sold Securus to Henry Brothers (now Kratos PSS) and Paul continued to soldier on for three more years before retiring at age 95.